The claim is that by adding raw butter to coffee you can improve your energy and focus long-term, without the jitters and inevitable crash. But why add butter and, more importantly, fat to your coffee? In case you have not heard, raw, grass-fed butter is actually quite healthy for you, rich in nutrients such as Vitamin A and hard-to-find K2. K2 is a rare vitamin, difficult to find in other sources, and it just so happens to be vital for absorbing calcium, of which butter is also rich, and, therefore, great for bone health. Raw, grass-fed butter also contains the healthy omega-3 and omega-6 fatty acid compounds in healthful balance, as well as a lesser known fat substance called CLA (conjugated linoleic acid). CLA is touted to be a cancer-fighter and increases metabolism while aiding in weight loss. No surprise, then, that it has been isolated and turned into a supplement. But we prefer to get our nutrients straight from our food. Butter fighting disease and burning fat? An interesting idea. One other interesting fact about combining a healthy fat with coffee is that coffee stimulates the release of bile from the gallbladder. Bile is the agent that the body uses to digest fat, so the coffee acts as a super charger for the butter, delivering it efficiently into the cells to be utilized. Talk about a perfect food combination! Really, any avant-garde way to enjoy a good dark roast is right up our entire team’s alley. This coffee experimentation seemed to spread through our offices like wildfire. Once one editor’s new coffee preps caught the attention of the rest, her well-caffeinated and enthusiastic response was to insist that everyone else try it for themselves the next day. And so, just a morning or two later, half our staff hovered over cups of good black coffee and tall shot glasses filled with, you guessed it, gobs of raw butter. As if we were engaged in some kind of healthy initiation, the hot espresso went carefully into the shot glasses, melting the butter until it was ready to pour back into the cups. When we were done, a few hot cups of coffee with floating oily rims were then waiting at the ready for the first sip. With the kind of pressure only a good editor can provide, we took our first sips and down it went.Warm, creamy tastiness, with a decadence that lingers on the tongue…what was that taste exactly? Waffles. Yes, waffles. The butter-coffee combination has left a few of us quick converts, at least for the time being, the best part being that oh-so-fabulous boost of energy, without that rough jolt. ‘Butter coffee’ provides great – if caffeine-centric – energy throughout the day, as well as a lasting aftertaste reminiscent of one of our favorite breakfasts. While we can’t strictly recommend this way of taking your coffee for daily consumption (fat is fat and energy is energy: unless you’re burning it, that intake can add up! ), the added butter does provide hormone-friendly fats. Saturated fats make cholesterol which in turn make hormones that contribute to, among other things, smooth, soft skin. Let’s be honest, it’s health trends like these that are just too easy to experiment with: taking butter in your coffee is just too decadent to pass up. If you’re particularly watching your figure, be aware of the extra calories – an added block of butter per week may tip the scale – but other that that, we like this A.M. indulgence from time-to-time for the added dose of vitamins and hard-to-get healthy fats. What do you say, are up for the initiation? Would you or wouldn’t you try adding raw butter into your morning joe? Share the post "Would You or Wouldn’t You: Drink Coffee with Raw Butter"
Interesting combination. Might have to take a gamble and try it out! Let us know what you think, Natalia! I work at a small cafe/bakery in Beverly Hills and we serve this ALL THE TIME! We make it with both unsalted butter and coconut oil. Our customers love it! Fantastic, Shelley! What cafe do you work at? We’re sure our readers would love to stop by for a cup ‘o joe! I always add coconut to my coffee and love it. Butter is made from cream , so it makes sense that it would be good in a cup of coffee. “unsalted” Butter is the B O M B in coffee!! good for you and oh so yummy! 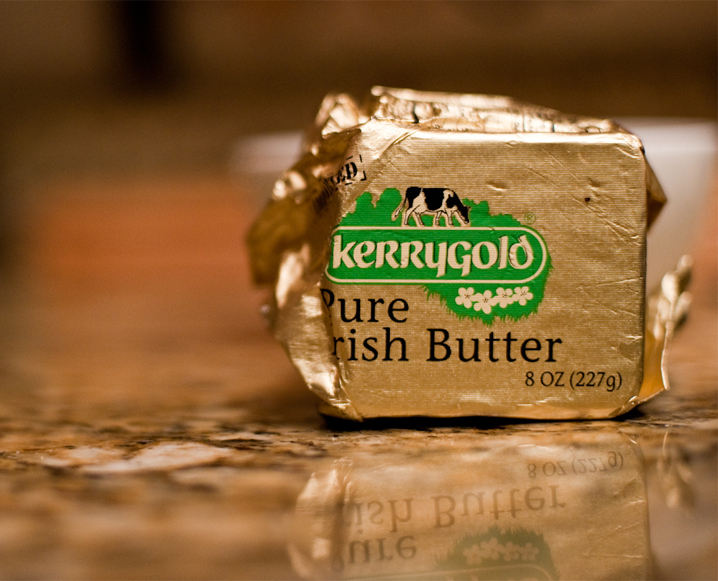 Kerrygold comes from grass fed cows, but it is not RAW butter. It’s made from pasteurized cream. You’d have to use butter from, say, Organic Pastures to have raw. The fact is, most GF butter does provide all the Vitamin A, K2, Omega-3’s, and CLA you mentioned. What it does NOT provide unless it’s raw is cancer/arthritis fighting Wulzen anti-stiffness factor (stigmasterol), which is destroyed through pasteurization.